Arsenal youngster Matteo Guendouzi believes that his club can defy expectations by winning the Premier League this season. The Gunners are currently undergoing a major transitioning phase after Arsene Wenger departed from the club at the end of last season after 22-years as manager. Wenger has since been replaced by former Sevilla and PSG boss Unai Emery. From a neutral perspective, the Gunners do not have as much quality in the side as the likes of Liverpool and Manchester City this season. They have also struggled for consistency during the past three years which ultimately led to the departure of Wenger. During the past two seasons, the once-mighty team did not qualify for the Champions League and they also finished a massive 37 points behind Premier League winners Manchester City last season. Guendouzi is a highly-rated talent who arrived at the Emirates during the summer transfer window in a £7 million deal from Ligue 1 club Lorient. 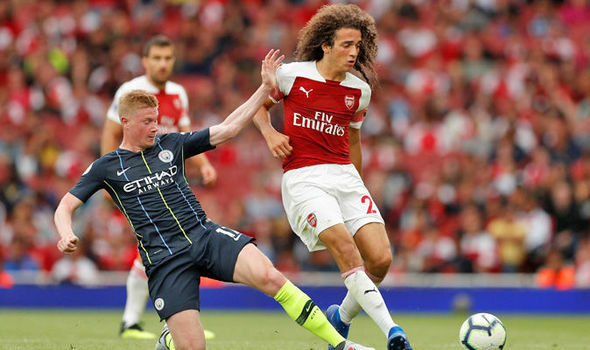 Following a strong pre-season showing during the opportunities given to him, Guendouzi was handed the opportunity to start during Arsenal’s 2-0 opening Premier League game of the season defeat against Manchester City last weekend. This would not have been an ideal way for the youngster to start his career but the result did come against one of the best sides in Europe. In addition to this, he also proved during the game that he is capable of playing at the highest level even though he was coming up against the likes of Kevin de Bruyne, Sergio Aguero and Raheem Sterling. Guendouzi could well lose his place in the Gunners side for this weekends clash against Chelsea if Lucas Torreira is fit. However, the 19-year-old would have certainly learnt lessons from the game which will serve him well as he continues to develop as a player. The youngster is convinced that his side stands a chance to win the Premier League this season. ← Previous Story Could Welbeck be Arsenal’s left-back for the season?